PDF of legal annual report with financial statements. PDF version of this site. Nearly a billion people across the world are going hungry while up to one third of food is wasted1). The Electrolux Food Foundation aims to do its part by promoting awareness, education and relief. Established in 2016, the Electrolux Food Foundation helps employees take action on food-related challenges. Employee initiatives are brought to life to inspire more sustainable food choices among consumers and professionals, and to support people in need in the communities around us. The Foundation supports the United Nations Sustainable Development Goals for Zero Hunger (#2) and Responsible Consumption and Production (#12). Food is also a major factor in climate change, and one of the key areas where individuals can make a difference2). All of the initiatives revolve around one of these three themes: to promote awareness about food waste and sustainable eating, to provide education on sustainable eating/cooking, and to provide relief meals. We have ambitious goals. By 2030, we aim to have educated over 300,000 people and served over 3 million meals for people in need. Here are a few of the recent Food Foundation initiatives. During 2018, a workshop toolkit called Food Heroes was developed and piloted by Electrolux, AIESEC and Worldchefs. The toolkit aims to inspire children to challenge and change their food habits. The toolkit is based on the UN initiative World’s Largest Lesson, produced by Project Everyone in partnership with UNICEF. “By engaging younger generations on these topics, we can help shape a more sustainable future,” says Malin Ekefalk, Director of Social Responsibility at Electrolux. Electrolux employees, AIESEC volunteers and Worldchefs members will use the toolkit in schools around the world. By the end of 2019, the aim is to have taught 30,000 children about sustainable eating. In 2017, Worldchefs developed a curriculum for culinary training. The goal is to train unemployed people to help them get a job in a professional kitchen. 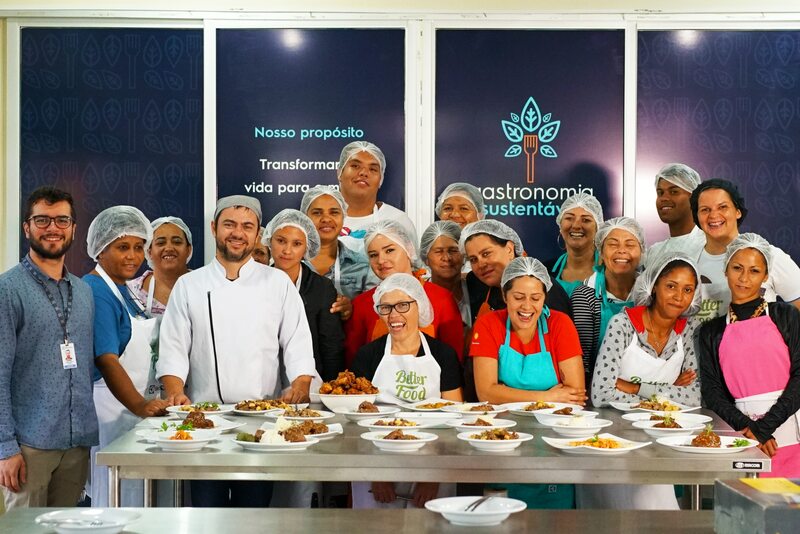 The curriculum was piloted the same year in Curitiba, Brazil, in a newly designed training kitchen at an Electrolux facility. The program has a sustainability focus and includes how to minimize food waste by using parts of vegetables and meat cuttings that usually end up in the trash. In 2018, the training program continued running in Curitiba, and the program rolled out to two more locations: São Carlos (Brazil) and Moscow (Russia). Since 2017, 92 students have graduated in the three locations. The focus in 2019 is to continue to expand the program to other locations in order to enable more people in need to find a job and provide for themselves and their families. For the third consecutive year, Electrolux in North America is committed to support people in need and fight hunger. This year, 4,500 Electrolux employees helped to prepare more than 87,000 meals. In addition, the company donated nearly USD 10,000 and 3,000 nonperishable food items to local food banks while also making the meals, volunteering in soup kitchens, and packing backpacks full of food for needy children during the week. “Our purpose is to shape living for the better, and fighting hunger is one of the most important ways that we can support our community,” says Eloise Hale, Head of Corporate Communications in North America at Electrolux. Plan the meals for an upcoming week in advance. Think about what you will do with the leftovers and how you will make the most of the ingredients. Look at what you have in your fridge and cupboards before you head to the shop. Buy only what you need for the week ahead. Dare to buy fruits and vegetables that are ugly – they taste just as good as the pretty ones. Use the entire product. For example, vegetable peels can be used to prepare stocks and broths. Keep your fridge at 4°C. Don’t fill your fridge too full – then the air cannot circulate and keep your ingredients at their freshest. Eat all the food on your plate. Don’t take more than you can eat! Find out how to properly store food. For example, bananas, pineapples and tomatoes are best stored outside the fridge. Don’t forget to use up your leftovers! Overripe fruits? Throw them in a smoothie or use them in muffins. Freeze food you won’t use before it goes bad. Electrolux shapes living for the better by reinventing taste, care and wellbeing experiences that make life more enjoyable and sustainable for millions of people. Through our brands, including Electrolux, AEG and Frigidaire, we sell more than 60 million household and professional products in more than 150 markets every year.